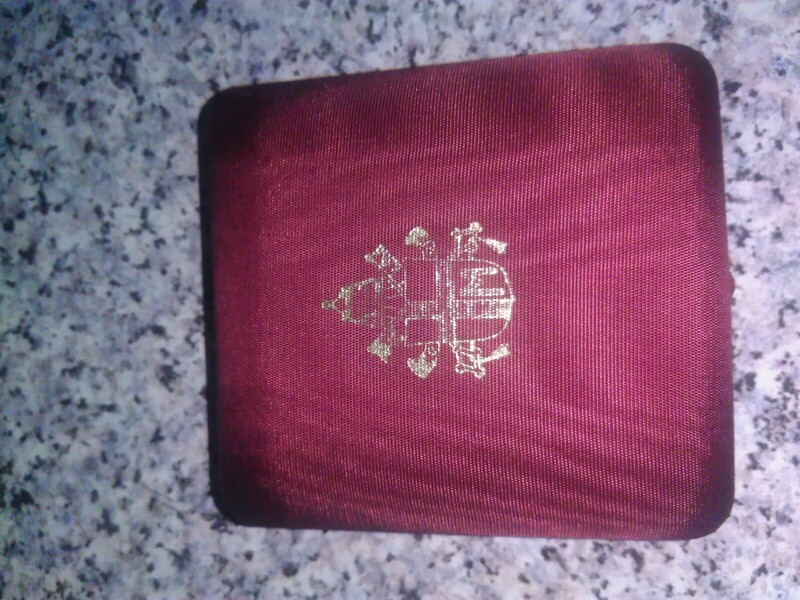 I have in my possession a big coin in a nice box with the papal heraldry of Pope St. John Paul II. I am very curious Where this coin came from and why this coin exists. I have found many different pictures but none like the one I have. This is the entire object photographed. When visiting Rome, it is quite a common thing to see pilgrims and tourists buying souvenirs either close to the Vatican or right in Vatican City itself. Buying a souvenir of the reigning Sovereign Pontiff is very popular when near the Vatican. 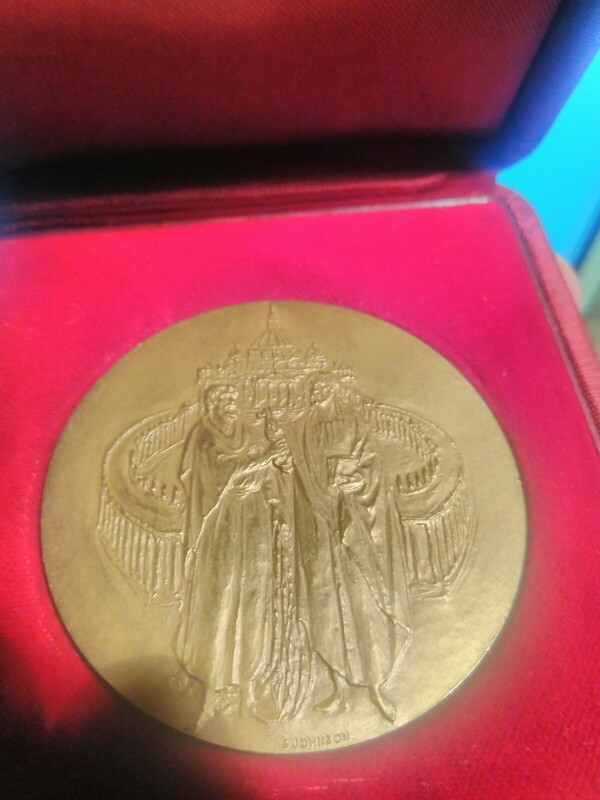 Traditionally any medal of a reigning pope will have his image on one side. 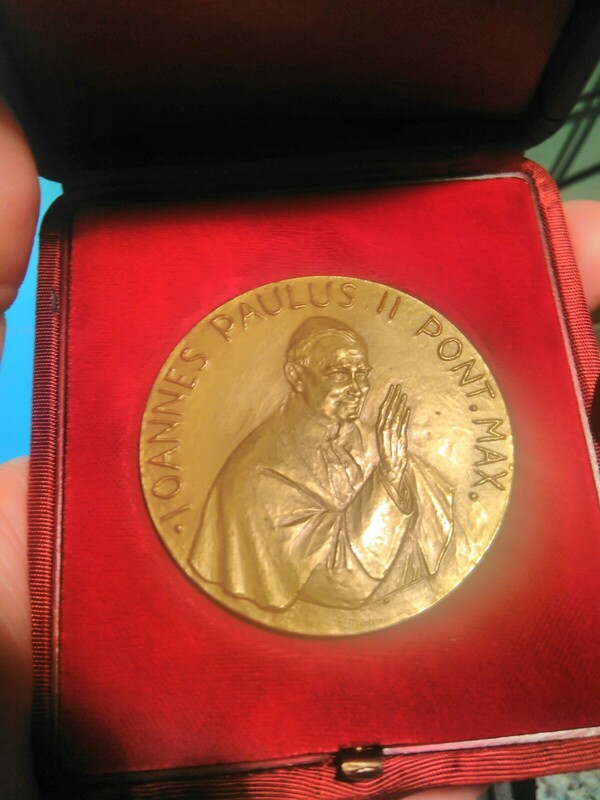 In the case of the medallion at hand it is of Pope John Paul II with the inscription: "Ioannes Paulus II Pont[ifex] Max[imus]" which simply means "John Paul II Supreme Pontiff". Medallions showing the image of Saints Peter and Paul (the two great Apostles of Rome) on the reverse side are still somewhat common. I am confident that this is what is portrayed on this medal as both person portrayed are bare foot and are bearded. Underneath the two Apostles of Rome one can read the inscription: S. Johnson (the artist who designed this particular medal). I have several such medallions of previous popes. Medallions of with the images Saints Peter and Paul have been around since the third century. 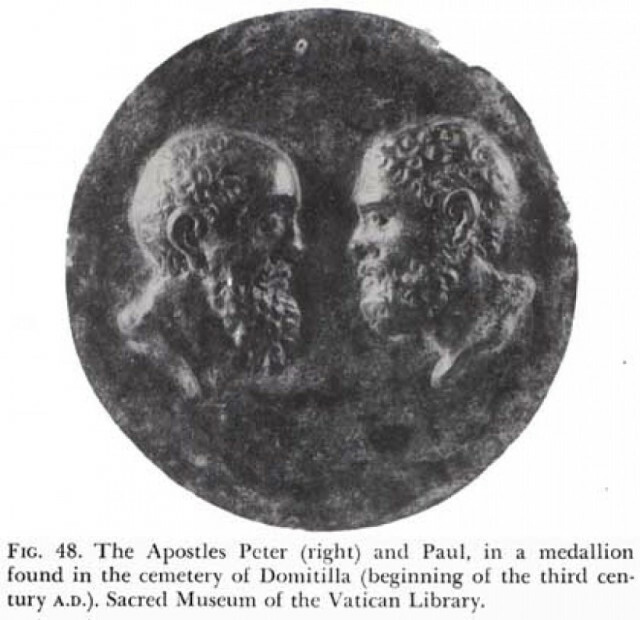 The 1911 edition of the Catholic Encyclopedia verifies the authenticity of this bronze medallion and identifies other sources for the likenesses of Saints Peter and Paul. This bronze medallion is in the Vatican Museum in Rome. "Ioannes Paulus II Pont[ifex] Max[imus]" means "John Paul II Supreme Pontiff". It's hard to tell what the verso is, but perhaps it's St. Peter passing his keys to John Paul II. Not the answer you're looking for? Browse other questions tagged papacy saint art global-christianity john-paul-ii or ask your own question. Why does the Roman Catholic church consider beatification of the pope? What personal possessions did Pope John Paul II have at the time of death? Has the Vatican issued clarification for pictures which appear to show Pope St John Paul II kissing the Qur'an? Does Pope Francis' rewording on the subject of capital punishment in the Catechism trump those of Pope John Paul II's encyclical Evangelium vitae?